I do not live in Vegas for a reason. The very possibility of winning at gambling would have me in a twitter ALL the time! I'm telling you, I buy a lottery ticket about once every 5 years and I can't sleep or do anything other than plan how I will spend or invest the money that I am POSITIVE I am going to win. The power of positive thinking? I have it! So, I don't really eBay a lot either, as it becomes all consuming. You might recall these Collins bags that I picked up this past Saturday. I have looked high and low and am unable to price them. So, that means that they are rare, sought after and expensive collector's items, right? OK. I know. That is most likely inaccurate. 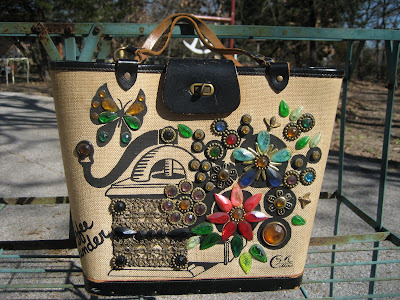 There are lots of Collins purses that one can't find on Google or eBay, right? Well, lest I price them and short myself, I have decided to sell them on eBay. Are you feeling the excitement? Is your heart, like mine, fluttering uncontrollably? I could only list them for 5 days, because I knew the suspense would kill me if I had to wait longer. If you want to join me in watching these auctions, or if you want to be the giver of excitement by bidding, then click here for "Along the Way". 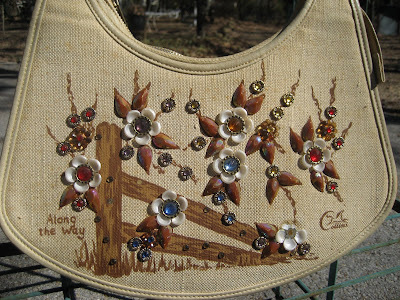 And click here for the money maker - gotta be the coolest - anyone who loves coffee - can't resist this kick booty "Coffee Grinder" bucket purse. I promise, I am seriously goofy, crazy excited about the possibilities! Good luck on the ebay venture! Can't wait to see what the bidding does! How fun! I hope we're together on Sunday when the auction closes because I enjoy watching your excitement! That is so funny and exciting. I had a Collins bag that I sold on ebay, it was hot pink. I couldn't believe what it ended up going for. It just makes you laugh! Good luck with your bag! Best of luck with the auctions! Mindy, We are following your auctions! It is so fun to have something on ebay .... like waiting for Christmas Morning sometimes! Good luck on Ebay! I hope they make you lots of money. I am very excited for you. I know you will do well with them, and I think you are smart for selling them on ebay. I'll be watching the auctions, good Luck. I've got 2 collins purses up there ending today. Debbie, blogging, in my book, is more difficult than eBay. EBay is a step by step process that is fail safe. Thanks for y'alls well wishes! No bids yet. But, we'll see!